A POD aquafarming design is suitable for both fresh and saltwater farming. The design utilise's self cleaning culture units and can be scaled from 20 tonnes up to 2000 tonnes production. The POD, passive filtration design makes the POD RAS ideal for Aquaponics on a commercial scale. The POD RAS Systems are intended to be integrated with broodstock, hatchery and nursery production. All training is provided by Aquafarmer Australia. It was Aquafarmer's first Commercial Design RAS and it is still in operation. Is there anyone else that can make such a claim? It's not about ego. The statement is about legitimate commercial success that has been denied both by an inept science community and shaky investor scams often supported by the science community. Below is real. RAS requires aquafarming technology, specific training, skills and academic education combined with solid financial support. If you do not have these skills do not approach RAS Aquafarming. The Broodstock System will consist of a semi-enclosed shed containing 4 50,000 litre tanks for broodstock control and maturation. The design is of a standard hatchery/broodstock design with exchange rate and sand filter systems and temp control. One system is for quarantine and 3 are for animal well being. The Hatchery will adjoin the Broodstock System and be of a standard marine style with added direct flow canals into the nursery to provide transfer without manual handling. It will hopefully include a digital counter for scanning larval movements but at this stage the device is still under construction. Something may be available commercially elsewhere? The Hatchery will have sufficient tanks and live food production facilities to provide a minimum of 200% of the actual hatchery requirements and output. Which is usually 200% of nursery requirements and in this case about 8 million larvae per seasonal run? The Nursery will consist of 4-6 open ponds for ‘green water on-culture”. These pond systems will have integrated plumbing for draining, grading and harvesting and direct injection into the growout system. Expected fingerling size at the expected transfer time would approximate 50 mm. However, start-up requires intermediate variations and possible staging. Nursery ponds will be 40 meters x 20 meters x 2 meters in depth and covered by predation net protection only. 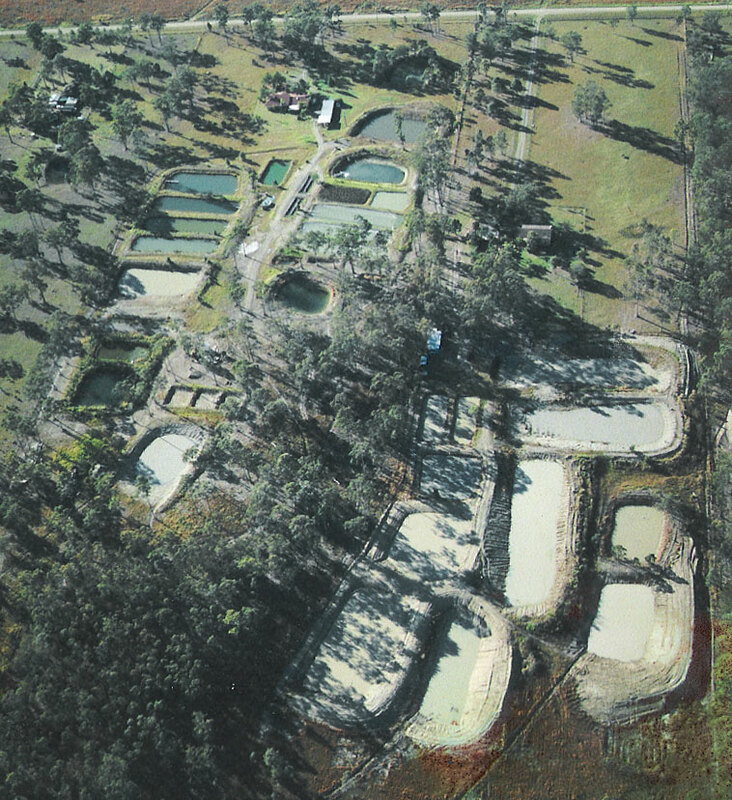 A 2000 tonne growout production requires a nursery stock of 4 million fingerlings production per annum over 4 spawning runs from October until February. This factor determines the exact nature of the hatchery and brood stock requirements in terms of numbers and tank sizes etc. Coral trout fecundity is in excess of 2 million so broodstock numbers should only need to be about 20 animals per season. These figures will be more accurate by early next year when all breeding work will be completed and the final hatchery protocol defined. The Growout System will operate as 10 separate sub systems containing 15 x 100,000 litre modules. The function of the modules is automatic in nature depending on fouling organisms which cannot be assessed at this stage. Each module will produce 7 tonnes per culture period. Mortality as a percentage of growout is as yet undetermined but initial stocking rates should be about 8000 fingerlings per module. The potential growth could anticipate possibly three crops per season as their wild growth rate appears to be only retarded by available natural feed. The Growout System will be stocked to achieve a final density of 7000kg per 6 to 8 month growout per module. There will always be a size variation overlap in profitable culture however, existing research data supports the commercial growth rate to be achievable within the commercial window of 2 crops per module per year. The Growout Tanks are to be 2 meters in height x 10 meters in length x 5 meters in width with aeration curtains on either side, a anticlockwise flow rotation, a central solid longitudinal curtain and a central drain and harvest point. I hope that the 15 tanks can be manufactured as one bank. Each bank will therefore cover 50m x 10m. The inside of the tanks will be a certain shade of blue to interpret the most favourable colour potential for marketing purposes. The Growout will have no temp control and it is to be out-door in nature covered with 80% shade cloth structure only. The Growout System totals 15 M litres with a max exchange rate of 80% of growout per day which equals 12 million litres per day. Which is 500,000 litres per hour and 8500 litres per minute. This figure equates to a continuous exchange rate of 155 litres per minute per 100 tonne module. Each module will include two staged parabolic filter screens per tank with an exchange rate of 40% approximately per day ramping up from 0 to 80% as a function of growth. This is the primary solids filtration system and is automatic requiring very little maintenance. The solids effluent can be either removed manually from the parabolic or flushed to a composting area, as yet to be determined. There is no individual bio-filter on each module as all effluent waters are to be passively filtered in the ‘passive filtration and sedimentation system’, before being reused or returned to the ocean. There is no individual pumping system to each module. In fact the farm only requires one pump. There is no individual air supply to each module. The design incorporates fish removal via 8” piping as a function of the tank design and water exchange. The fish are caused to flow into a processing shed and across grading bar structures without being handled. At which point they are to be further sedated for handling and processing. In an RAS system of this size it is essential all grading and pre sale fish transfer be carried with a high degree of automation. For example 2000 tonnes per annum equals 7 tonnes per day over a 300 day harvesting regime. Which equates to harvesting 1 tank per day over 300 harvesting days after approximately 200 days culture. The majority of staff will be involved in harvesting and on-processing while also having fall back duties in various aspects of growout and nursery culture. No consideration has been given to cold storage or live trade handling. But both will be needed in the final costing. However basically the harvest equals approximately 10 x 1 tonne live export bins per day ex New Cal, as an example. The 2 inlet pumps will probably be around 100kwatt each or sufficient to maintain the system under full production. The nature of the nursery and the growout system will be gravity feed with enough standby water for at least 2 days function without power. A 100kwatt pump delivers 1000 litres per second. The hatchery and broodstock systems will be supplied by both gravity and pump systems through sand filtration and then through 0.5 micron filtration and chlorination. The nature and size of all plumbing will be relative to availability and necessary pressure and flow requirements. They cannot be costed until after SEV. The header pond will require primary filtration and, is still in design stages. The POD RAS is a passive filtration system that works without labour involvement, mechanical filtration and staged pump requirements. It will have a total volume of maximum flow x 48 hours = approx 30 Mega litres. The waste water is caused to flow in such a way that all suspended solids fall out in specific collection areas. This waste, as a mass can effectively remain in the system for considerable times without causing water issues. The water, once removed of particulate material is caused to flow over “live rock” at very slow velocities where by dissolved nutrient loading can be taken up and removed and the water pumped back into the header pond at a variable rate according to culture requirements. I usually include filter feeders (oysters) in both the sedimentation and header systems as an indicator of water quality. An extra flush to waste system has been incorporated where by the removal of ‘skimmed’ wastes can be passed over the parabolic filters and then removed to a natural sand filter and solids reclamation system. It is visualized that a small backhoe be used in waste management and composting of faeces and other solids. It is intended that the design incorporate automatic harvesting where, as a function of water draining from a specific module, the fish are flushed into a special processing shed containing harvesting tanks with polished aluminum grader bar systems for grading each crop. A process very similar to trout and salmon harvesting. This procedure is done using sedative dosing to insure there is no stress or damage to the fish prior to export. A smaller but similar design will be incorporated into the nursery system along with automatic counting of harvested numbers. Due to the automatic nature of the design only 20 water quality telemetry units will be required for complete farm control instead of approximately 150 normally required. Each unit will measure the important water quality parameters of each sub system as well as the input and output of the PFS and the Header Input system. The telemetry systems feed back to any laptop capable of accessing the internet and provides monitoring of the system with 5 second updates. It can program feeding frequency as well as feeding times and quantities as well as provide constant alarm backup for any and all likely scenarios. A farm software package can be included for daily operational work and monitoring of stock through the systems. I imagine a design allowing farm overview and three dimensional zoom with manual updates as to flow, feed and current size and growth rates temp etc. I have spoken to the engineer building the telemetry systems and, along with the programmer, they both are capable of such a new state of the art package. The life of the probes is 3 years only. You will note the lack of staff required to operate a POD RAS design. And it can be seen as to why. The farm design runs with mainly passive elements and gravity feed of water. 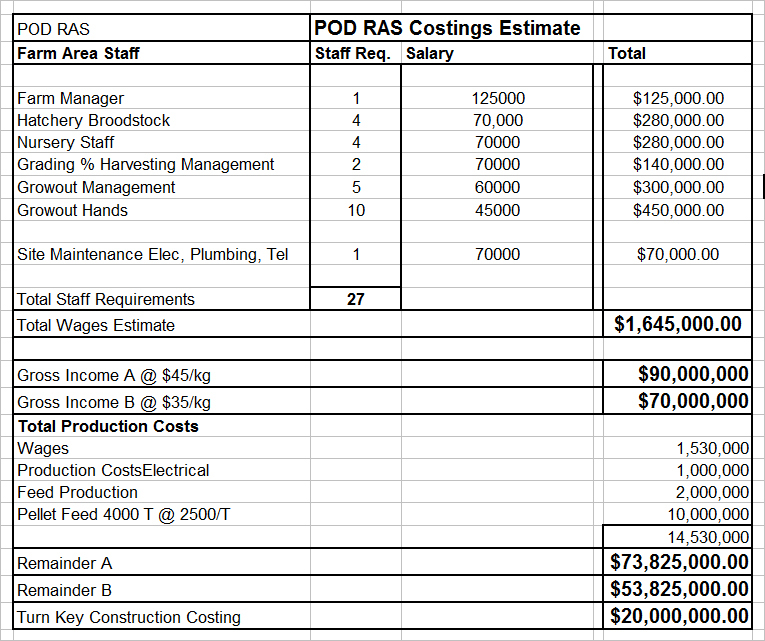 Efficiency longevity and automation are design essentials for POD RAS. In regard to staff, included is a brief estimate of full time staff and potential salaries if operating in Queensland. However with the right staff there could easily be some considerable overlap on tasks. These types of jobs may also be supported with production bonuses. No consideration has been given to holiday structure or sick leave within the example of staff as show below. The tanks systems should tend to be almost entirely self cleaning to a standard required for consistent culture. Organisms commonly known as fouling will congregate to the walls but as to a greater degree they are beneficial and harmless. Their species and nature is part of the SEV research. Having said that faecal contamination within the modules is highly dangerous and I have experienced previously unknown pathogenic activities from opportunistic organisms in RAS. These unknown factors will be the greatest concern for the first few years and are essential elements for module design and continued improvement. Or maybe the harvesting system can be utilised to clean systems as required. Still pondering the outcomes>>>>> In any case, fouling will be an issue. The SEV or site evaluation has many aspects as I am sure you can now appreciate. Aquafarmer's engineering designer approach is to take a sketch book and calculator and walk the site several times, studying all aspects. It is at this time of mental assessment, many science and engineering questions can be answered and many more are asked. Once the operational plan structure is clear, the potential risks and design problems can be imagined and managed. Problems can be easily solved well before construction. Such imaging or visual presentation then allows experienced reflection on design as a first edition draft. We utilise many pictures of aspect including underwater vision of the site to evaluate the quality of all services and surrounding influences.